Sometimes you simply need a lawyer to fight for you, and if that is your situation, you have found the right law firm. With tenacious legal support, you can get the compensation that is rightfully yours. Whether construction site injuries, an occupational disease or work related pushing, pulling or lifting injuries are the reason for your workers compensation claim, Pyrros & Serres LLP can help. We also help clients who suffer injury through daily work that results in joint injuries or repetitive motion/stress injuries. Our Queens workers compensation lawyers have decades of combined legal experience and can provide the legal skills you need to level the playing field. Workers frequently make the mistake of thinking their employer or insurance company is looking out for them. Sometimes they think their injury is obvious and the claim should be simple, but believing this doesn’t take into account the way insurance companies evaluate claims. Insurance companies focus on their bottom lines and invariably they want to pay the least amount of compensation possible. We know it’s unfair. Our goal is to seek justice and help you get the medical and monetary support you need. Our firm has a reputation for resolving cases and serving justice, which often makes litigation unnecessary. Insurance companies avoid litigation when they lack confidence about their ability to win, and when coming up against a firm with a track record of success, they often settle. Frequently, we can achieve out-of-court settlements that deliver fair compensation and avoid the costs of courtroom battles. At the same time, we stand prepared to take your case to trial if needed to protect your right to benefits. Don’t Risk Your Compensation. Phone lines are open 24/7. 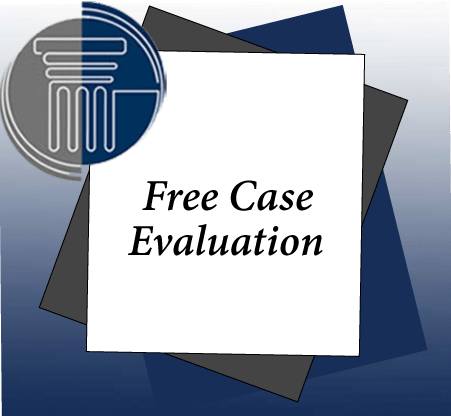 We offer a free case evaluation and take your claim on a contingency fee basis. You owe no fees unless we obtain workers compensation for you through settlement or award. Call our Queens workers compensation attorneys at (718) 804-5430 to arrange a confidential consultation. In addition to workers compensation benefits, you may be entitled to third party compensation. When a third party negligence is also responsible for your injury, we can help you pursue a personal injury claim against the third party. For example, if defective equipment contributed to causing your injury, we can help you pursue a personal injury claim against the equipment manufacturer. Do You Have Questions? Our Videos Provide Basic Answers. Our workers’comp attorneys have successfully resolved workers’ comp cases and claims in NYC. Listen to their advice on the nuances of worker’s compensation law in New York. Our office is located in Queens, NY, and our law firm serves hundreds of clients throughout the New York City area, including the Bronx, Manhattan, Long Island, Staten Island, Brooklyn and Queens. Clients who have been injured through construction site accidents, all types of workplace accidents or who have suffered ongoing work injury come to us for legal assistance, and we help them obtain the compensation they deserve. I want to thank you for all your help; it has been a stressful time for my husband as well as for my family. We are so grateful for the great doctors and especially for you, helping my husband in his workers compensation case. We will never forget the kindness and the time that you took to help us in this devastating time in our lives. God bless you. With special thanks and sincere appreciation for everything now and in the future. I cannot thank you enough for all you have done for me. This last surgery would not have happened if it wasn’t for you. 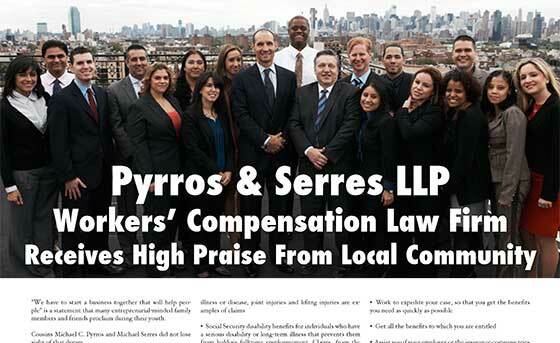 By putting Pyrros & Serres LLP on your side, you add decades of experience and expertise to the prospects of obtaining the compensation you are entitled to receive by law. Our workers compensation attorneys’ bold and persistent approach in pursuing your claim is geared toward achieving a favorable outcome. Call us today and find out how we can help. Serving clients throughout the New York City area, including the Bronx, Manhattan, Long Island, Staten Island, Brooklyn and Queens.